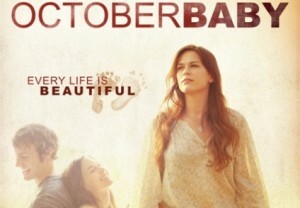 If you haven’t yet seen the film October Baby yet, find the time to do so. I can’t recommend it strongly enough. It’s one of the best films I’ve ever seen. I’m not going to critique the film or focus on the obvious pro-life aspect of the story (that’s for you to discover for yourself), but rather I want to mention a wonderful secondary aspect of the film that has much to do with dating and the meaning of love. A young man and young woman (both college age) are the main characters. The young man portrayed in October Baby is a shining example of every way to behave around and treat a woman. What particularly impressed me is how this young man was not deterred by the obvious emotional baggage this young girl was carrying around. In quite a few situations in the film, her behavior, directly stemming from her understandable emotional scars, is enough to chase away most men. With stellar commitment to the friendship with her that he obviously considers in the highest regard, he fearlessly stands by her and helps her through the negative happenings her baggage causes her. In a word, he helps her unpack her baggage. In fact, he finds the love he has for her includes accepting her emotional baggage as part of the mission of love. So what are we saying? That without baggage, everyone is perfect? Another way to look at it might be this: think of what someone brings into the relationship as luggage. Luggage is what you need to have with you. Baggage is what you thought you needed, but you don’t. I’ve heard it said, “Love is having someone willing to help you unpack your baggage”. This is the right idea. If it’s something that’s a part a person, the luggage is not a burden to be avoided, but a part of the whole person you are to love. To unpack our luggage happens often only when we have help from another, especially one who knows us well and loves us enough to handle us with care. As you are dating, it doesn’t take long to discover things about the other that seem like more than you can handle. The question is not whether or not the person you date has luggage. The real questions become, is this something they need to bring with them? And is it something that you can accept? And can they accept all of you? It’s about finding someone who wants to bring your luggage along for their trip through life. It’s not a burden, but rather an endearment worth working through with you. If it’s an emotional scar, then love inspires patience. If it’s children from a previous marriage, then love inspires courage and trust in God to embrace those children and all the challenges that come with that dynamic. If it’s a physical handicap, then love doesn’t allow any physical condition to convince that this person is not worth it. Baggage might very well be severe enough to make a healthy relationship impossible. But most luggage doesn’t means that a person is not marriage material. It’s understandable that someone’s baggage can be a deterrent as you are dating. It can be scary to consider what you have to deal with when it comes to this person’s past, or his emotional state, or even a physical condition. Maybe this person had abusive parents, or children from a previous marriage, or some kind of scar from the past that can explain why he behaves a certain way in the present. Everyone has luggage of some kind and to some degree. It’s wrong to believe that whatever your luggage is, no one will want to deal with it, and thus no one will want you. Is there such thing as compatible luggage? I think so. Two people have to be able to understand each other when it comes to the things that comprise the negative and imperfect things about us. This is why two who have similar experiences make a good match. Two people who grew up with abusive parents, in the same city, or with the death of a parent will have much to talk about and be able to relate to each other. The same with two people who are both recovering alcoholics, were previously married, or are cancer survivors, etc. Their similar luggage provides a natural connection and past experiences to make each other comfortable. In general, accepting and dealing with another person’s luggage is a matter of love, kindness, patience, and compassion. You don’t have to have gone through something in order to be able to empathize with that person and have a friendship. You just have to be willing (as in “by act of the will”) to understand where that person is coming from. A good, close friend knows how to listen, and how to be helpful, even when they can’t relate from personal experience. They care and they love, and that motivates the desire to want to know the luggage you have, and help figure out how to unpack it. Being scared off by someone’s baggage might be more of a testimony to your own fear, rather than your inability to handle it. But it is important to be honest. If the person you’re dating has too much baggage for you, then by all means, end the relationship. The last thing that person needs is someone who is only going to hold her past against her. That’s not friendship, and that certainly isn’t love. October Baby presents a beautiful example of love that grows because of the courage to help bring the luggage and unpack it. True love provides plenty of overhead storage for both of you.